Height: 89 cm / 35 in. First presentation - December 23, 1989, Concert Hall of the Moscow Energetic University. 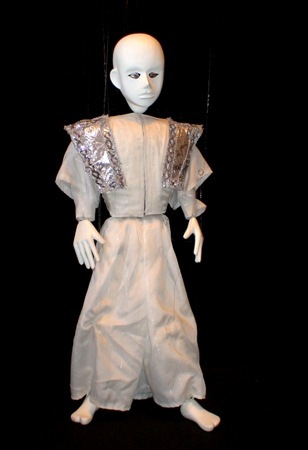 This very difficult transforming puppet is made according to the ancient Indian philosophy. See PHOTO ALBUM of SECOND BIRTH. Step 1: dance of the puppet (a head without eyes). Step 2: separation of the head. Step 3: dance of the puppet without head. Step 4: opening of soul. Step 5: birth of new head. Step 6: dance of the puppet (a head with eyes). Second birth in TV show, Leningrad, USSR, 1990. Second birth in film "Nikolai Zykov Theatre of marionettes", Moscow, Russia, 1993.